We ran out of roti a couple of days ago, so I made another batch. I also made a west indies style chicken curry in the Instant Pot and another batch of rice and peas. 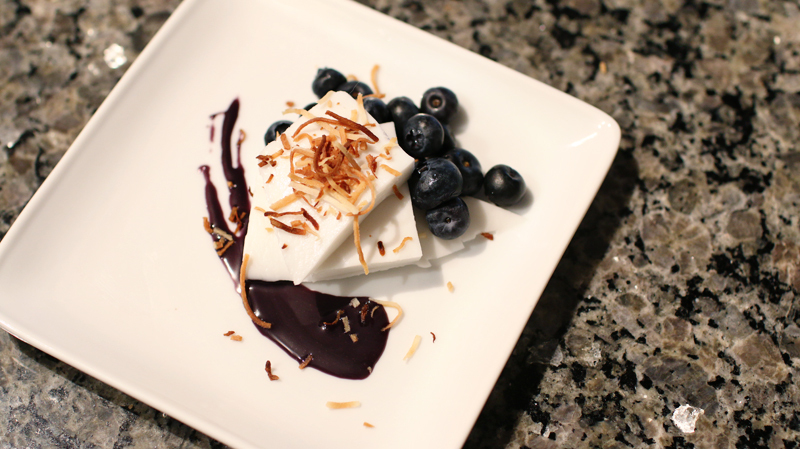 I had half a can of coconut milk left, so I used it to make a half portion of this haupia recipe, which is a Hawaiian coconut dessert that hubby and I both love. It was super easy to make, but it had to set in the fridge for 8-24 hours, so I promptly forgot about it. Until today. I cut us three little pieces each, but they looked kinda naked on the plate, so I decided to add some blueberries. The recipe called for some toasted coconut, so I thought, "why not?" Then I remembered we still have some of the taro condensed cream from the Filipino supermarket, so I decided to fancy up the plate even more. My "edible art" needs some work, but I'm more than happy to keep trying. The end result was delicious!